REDD+ has the potential to deliver social and environmental benefits that go beyond the reduction of greenhouse gas emissions, but which may also entail potential risks to people and the environment. These benefits and risks will depend on a number of factors related to national circumstances – such as how REDD+ actions are designed, as well as where, how and by whom these actions are implemented. Safeguards are measures to protect or to avoid risks (do no harm), while promoting benefits (do good). Seven safeguards, also known as the "Cancun safeguards", were agreed for REDD+ at the 16th Conference of the Parties to the United Nations Framework Convention on Climate (COP16) in 2010. Safeguards need to be ‘addressed’ and ‘respected’ throughout REDD+ implementation. National-level safeguards information system (SIS) needs to be put in place. 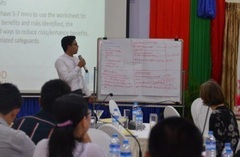 Summaries of safeguards information, reporting on addressing and respecting, need to be produced periodically. 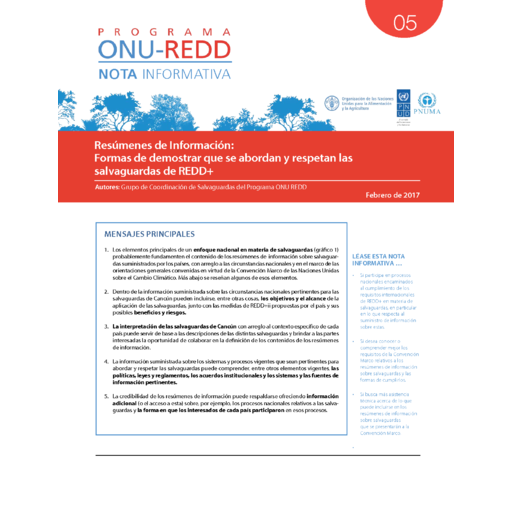 The UN-REDD Programme’s guidance and tools are designed to enable countries to take a flexible approach to meeting these, and other, safeguard requirements in a way that reflects different national circumstances, contexts and capacities. This refers to the existing governance arrangements and processes – policies, laws, regulations, institutions, etc. – that countries can draw on to respond to international REDD+ safeguards requirements in a way that is harmonious with national policy goals. Provide transparent and consistent information that is accessible by all relevant stakeholders and updated on a regular basis. Be transparent and flexible to allow for improvements over time. Provide information on how all of the safeguards are being addressed and respected. Be country-driven and implemented at the national level. The development of a SIS does not necessarily require establishment of an entirely new system. 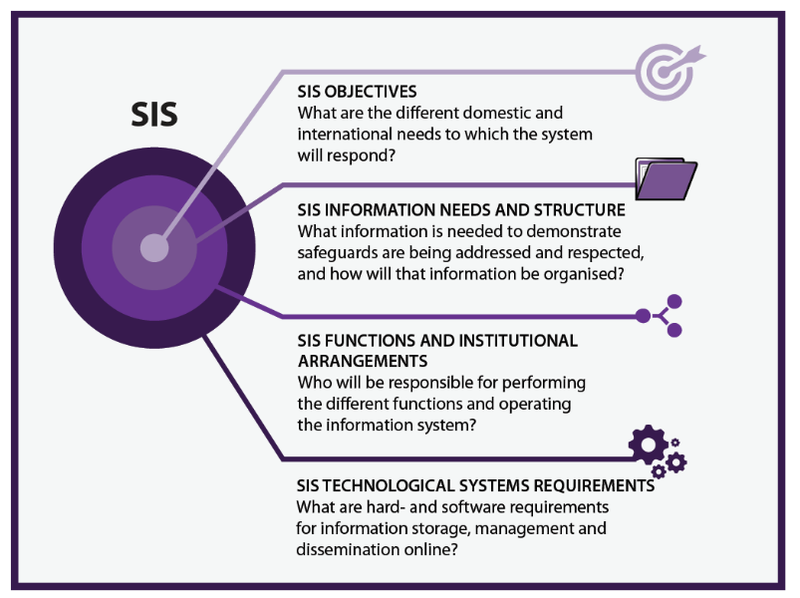 It may be more cost-effective in the long term, to develop a SIS from a combination of existing information systems, sources and institutional arrangements. SIS provides a strong basis for developing summaries of safeguards information. Some the key design considerations for this system are summarized in the figure below. 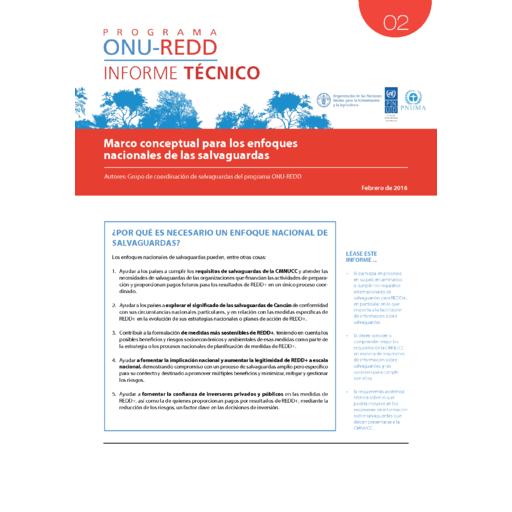 These summaries of information are country reports on how all the Cancun safeguards are being addressed and respected. 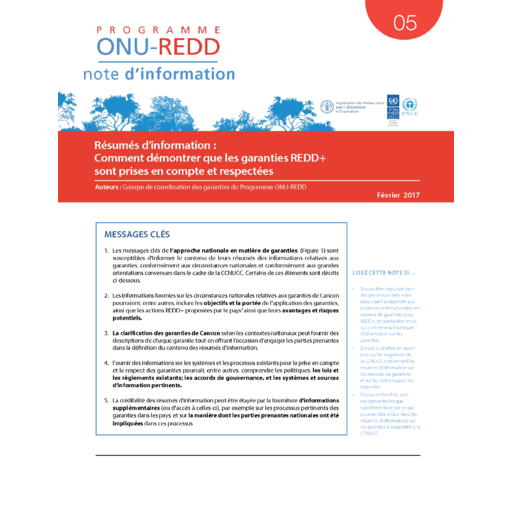 These summaries of information should be provided periodically upon commencing implementation of REDD+ activities, at least every four years or at any time by submitting them to the UNFCCC. 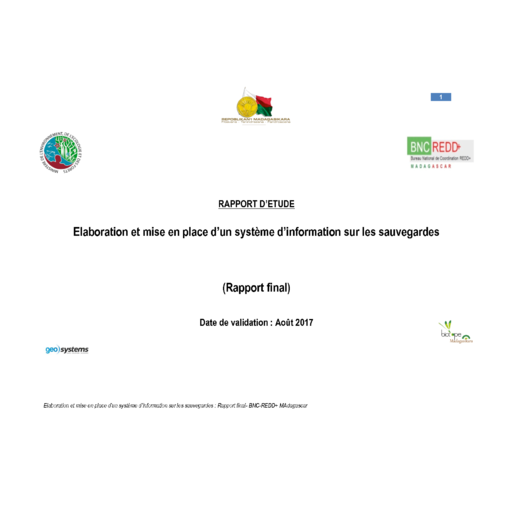 Countries are encouraged to improve the information contained taking into account a stepwise approach. 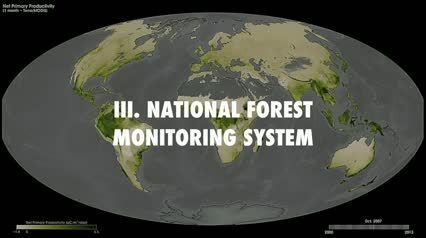 REDD+ activity or activities that are included in the summary of information. National circumstances relevant to addressing and respecting the safeguards. Description of each safeguards in accordance with national circumstances. How each safeguards has been addressed and respected. Summaries of information are key tools to ensure legitimacy of REDD+ as a policy option contributing to Sustainable Development Goals and provide an opportunity for promoting confidence in safeguards processes. What are the Cancun Safeguards? Safeguards are measures to protect or to avoid risks (do no harm), while promoting benefits (do good). Seven safeguards, also known as the "Cancun safeguards", were agreed for REDD+ at the 16th Conference of the Parties to the United Nations Framework Convention on Climate (COP16) in 2010. How do I ‘address’ and ‘respect’ the Cancun safeguards? By identifying and implementing the policies, laws and regulations found in a country that are relevant for each of the seven Cancun safeguards. Also, putting in place institutional arrangements and procedures that allow the respect of the principles encompassed in the safeguards. 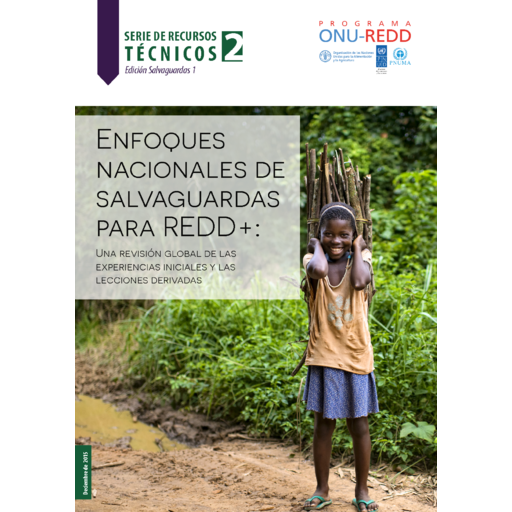 How do safeguards relate to REDD+ actions? While the main purpose of REDD+ is to contribute to global climate change mitigation, REDD+ also has the potential to deliver other benefits, both environmental and social, to countries that choose to implement it. Safeguards can inform the criteria and actions needed to reduce environmental and social risks that are associated to the implementation of REDD+ actions; they also promote the identification and enhancement of potential environmental and social benefits. 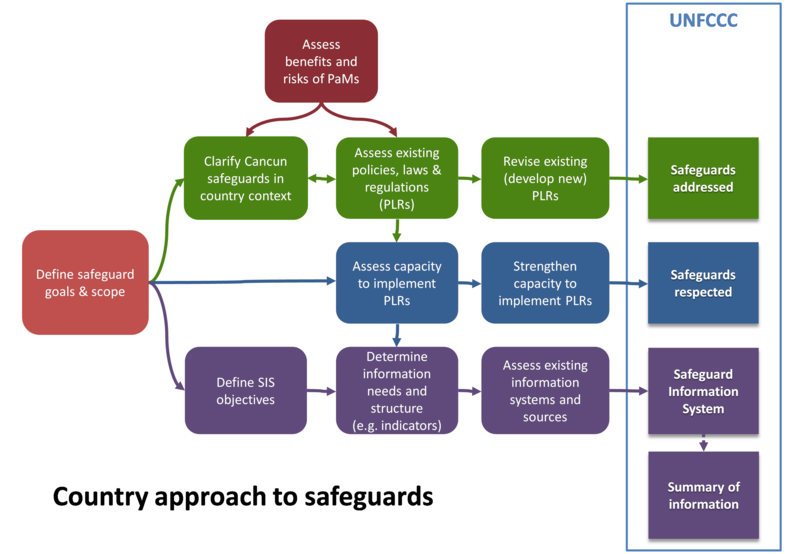 Can requirements for more than one safeguard framework for REDD+, e.g. UNFCCC, World Bank and Green Climate Fund, be met simultaneously through a single harmonized process? This depends on the country approaches to safeguards and the agreements reached with different donors. However, there are opportunities in building a single harmonized process for fulfilling several safeguards frameworks requirements. Find the latest country Safeguards outputs at the Safeguards Country Resources Hub.